Francesca Dale in Art & Photography Culture & Arts Philosophy & Religion on 5 December, 2016. Sri Lanka is known to be a country with one of eldest Buddhist heritage, with Theravada Buddhism standing as the major religion, and boasting around 70% of the country’s population as followers. Various long-standing cultural sites are dedicated to the Buddha, such as the Dambulla Caves. Siddhartha Gautama is the predominant figure whose teachings are those upon which Buddhism was founded, and thus the image of the Buddha and its various associated poses reincarnated. Those who commit to Buddhism find that to look upon the Buddha’s image can stimulate meditative thought, leading them to visualise the qualities and meanings that the Buddha embodies. The power of symbols can communicate with those who speak different tongues and write different languages, also reaching out to those who are illiterate, emphasising the importance of symbolic visual art in communicating religious doctrines. One may note that the image of the Buddha is generally presented in a number of recognisable positions, such as resting or sitting for example, with different facial expressions such as smiling or laughing. Similarly, one must pay attention to the hands of Buddha, as they are formed in a number of different ways with varying gestures. There are over a hundred poses illustrating the life of Buddha with a specific hand gesture. The positions of the hands are called a Mudra, which are identifiable by referring to both the crafting of the fingers and the hand’s shape. Different facial expressions and body postures equate to different qualities that Buddha himself embodies, values and teaches as inspires to onlookers. The Buddha is intended to symbolise grace, balance, compassion, wisdom, determination and courage – values which, when these monuments are visited and observed, aim to be transmitted to onlookers and eventually motivate them to be learnt, understood, and practiced. One can note also that that their height, size and even accessories all constitute to identifying with Buddha and the various phases of his life, or past life, and teachings. Lotus Buddha, Damballa Caves, Sri Lanka. 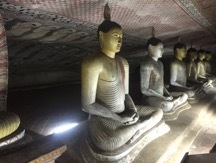 Dambulla’s Cave Temple in central Sri Lanka, also known as “The Golden Temple of Dambulla”, is a celebrated World Heritage Site featuring five separate caves within a cave temple complex. After a roughly an hour’s ascent with not only fellow travellers but also many adorable monkey families, one finds themselves looking upon the surroundings of the caves, which boast breath-taking sceneries and rock towers that stretch over 160 metres in height. Each cave contains magnificent statues and are embellished with paintings, all of which revolve around the sustained symbolic focus of Gautama Buddha and his teachings. Within the caves there are a total of 153 Buddhas, crafted from the cave itself, which stand amongst statues of gods and goddesses, including Ganesha and Vishnu (of Hinduism). The intricately painted murals cover an astonishing area of 2,100 square metres and one can see depictions of Buddhist teachings adorning the walls from all angles, swarming the ceilings and boundaries with incredible detailed depictions. 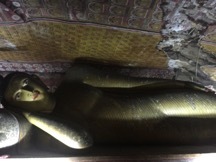 Reclining ‘Nirvana’ Buddha, in Damballa Caves, Sri Lanka. Within the Dambulla Cave, the first of the caves is known as the “Cave of the Divine King”. This location was entirely engulfed by the reclining Buddha, otherwise known as the “Nirvana Buddha”. This figure stretches a daunting fourteen metres, solely fashioned out of the natural rock itself. This pose can be linked to the Historical Buddha in his last earthly moments. The meaning of Nirvana can be allied within the enlightenment that Buddha found, as he was able to escape and transcend the endless cycle of birth, death and rebirth, which is the suffering by which this world is conditioned according to Buddhist philosophy. These caves are both an artistic spectacle, a natural wonder, and a strong and faithful profession to Buddhism.